The near ambush has the expressed purpose of destroying the target. This often requires an assaulting force to literally overrun the target after the initial volley of fire has inflicted tremendous damage. Again, the intent is to destroy everything. 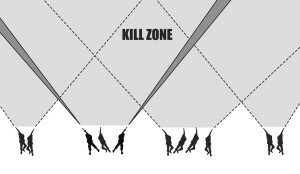 Since the patrol will overwhelm the target, the patrol will get as close as possible to the enemy. This close proximity also means that friendly forces MUST outnumber the enemy target.